Chicken is a very popular dish. Make this menu as your favorite by mixing many ingredients. 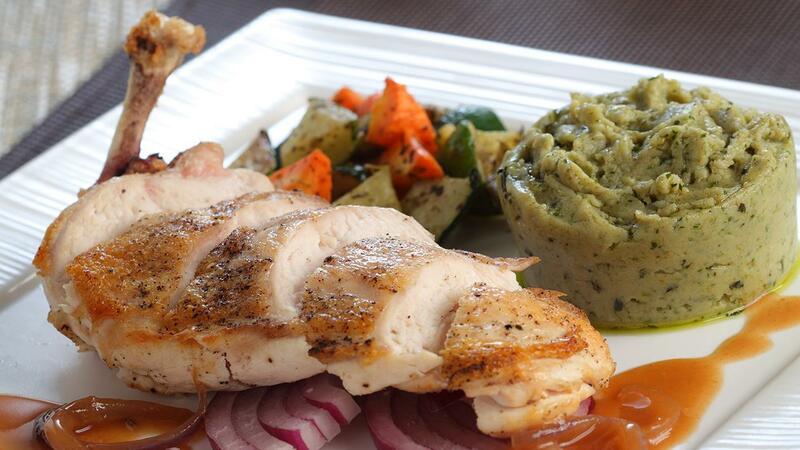 From pesto mashed to onion, will make the grilled chicken rich of taste. Marinate chicken with Knorr Chicken Powder, black pepper, and garlic, leave for about 15 minutes, heat pan, add oil, seared chicken breast, then roast in the oven. 8 minutes Sauté red onion for about 5 minutes, add Demi Glace, cook with medium heat, stir well, cook for about 3 minutes. Heat milk in the pan, add Knorr Mashed Potato, cook in medium heat, mix well, add pesto sauce, stir. Season vegetables with salt & black pepper, sprinkle a little bit of oil, then grilled vegetables.